LTC Eric Kruger died November 2, 2006 from injuries sustained when an improvised explosive device (IED) detonated near his vehicle in Baghdad, Iraq. Also killed were LTC Paul J. Finken and their driver SSG Joseph A. Gage. It was Eric’s first day in Iraq when he was killed. He is survived by his wife, Sara; four children, Caitlin, Joshua, Christian, and Elise; parents, Carol and Lawrence; brother, Douglas; and sister, Kristy. Eric Kruger was born to Lawrence and Carol Kruger in Heidelberg, Germany on January 12, 1966. He spent his childhood in Garland, TX, and he attended Southern Methodist University in Dallas, attaining a Bachelor’s degree in Political Science and a Master’s degree in Liberal Arts. Eric was a member of Pi Kappa Alpha Fraternity, as well as the SMU ROTC program. Eric figured serving in the Army was a privilege, just like three generations of his family before him. His great-grandfather served in World War I, his grandfather in World War II, and his father in Vietnam. When it came time for Kruger to go to Iraq, he thought of it simply as his turn and his duty. Eric enlisted in the United States Army in 1986. 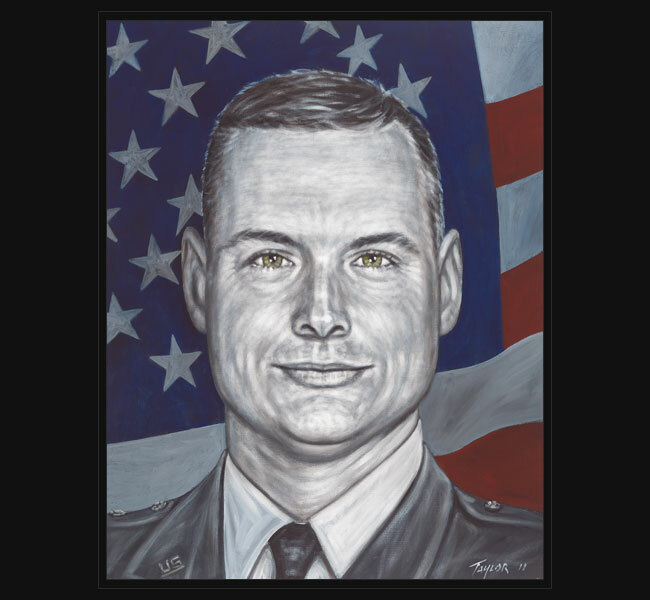 He received his commission in 1988 and joined active duty service in 1989 upon graduation. Eric was a passionate man who poured himself into every task, no matter how small, who found a way to laugh in every situation, no matter how difficult, and who strove to do what was right, no matter the cost. He was a true patriot who died serving our country and protecting our freedom. He was a loving husband and father, a devoted son, grandson, and brother. “He wanted to make sure that everything he did was right,” Col. Jeff Bannister wrote. “He was not only a great Soldier but a devoted family man. He had an eternal love for his wife, Sara, and his four kids. At the end of the day on November 2, no one could have asked for more”. LTC Eric Kruger was 40 years old from Garland, Texas. Original portrait was presented April 26, 2012 to his parents during a special event hosted by the Dallas Salesmanship Club in Dallas, Texas.